This post has been kindly sponsored by Canada Dry®. All thoughts and opinions are my own. There’s nothing more relaxing in the summer than a cold + refreshing drink in hand. 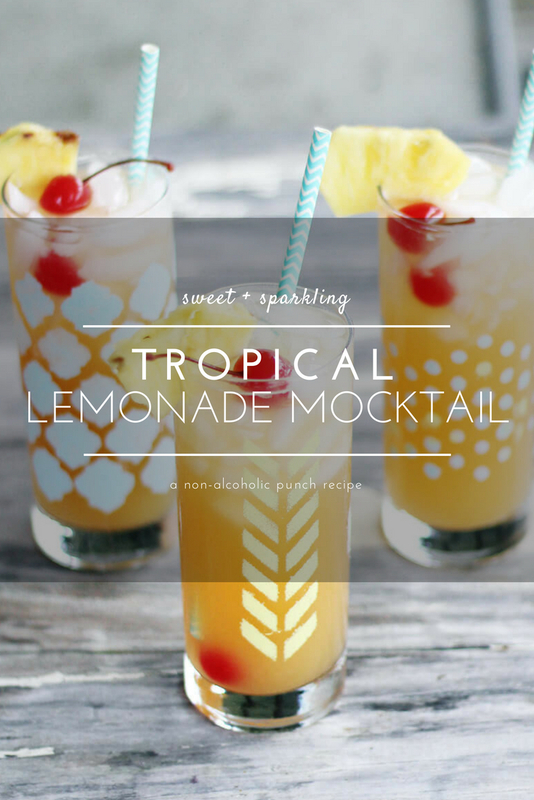 This Tropical Lemonade Mocktail recipe is sparkling sweet and just the perfect amount of tart. 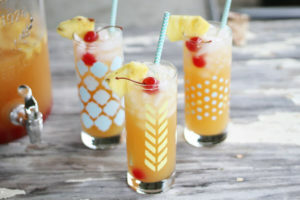 Made with Canada Dry Ginger Ale and Lemonade, pineapple juice, mango nectar and fresh fruit, this is an easy mocktail punch recipe you are going to love. This post hits all of my summer high notes. 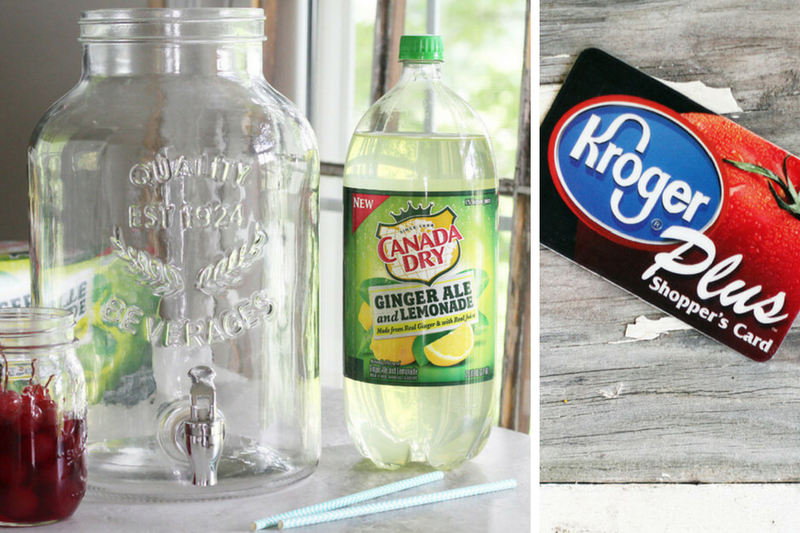 A fun + easy craft idea plus a juicy and sweet mocktail recipe to sip on while you take a break and relax. First stop? Kroger. Yep, a few clicks to my ClickList and all of my mocktail-makin’ supplies were ready for pickup. Of course I had to have my new fave sipping beverage, Canada Dry Ginger Ale and Lemonade. (Exactly what you need to make this punch.) 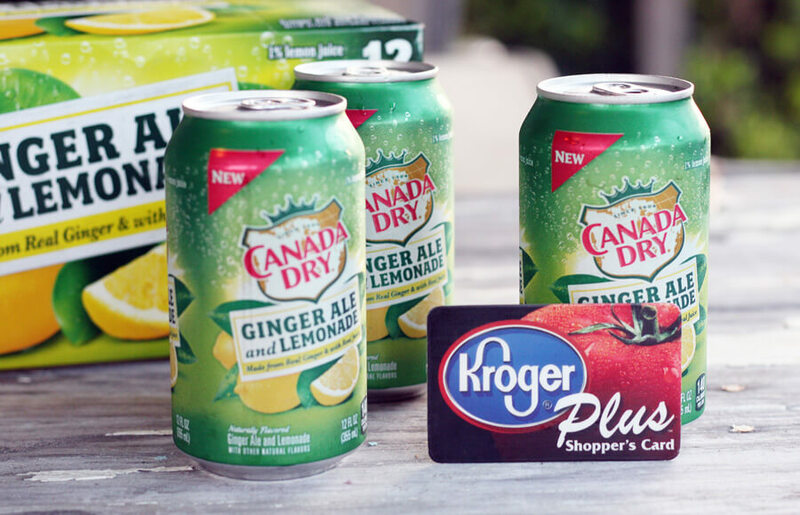 Click HERE to add it to your Kroger Clicklist now. 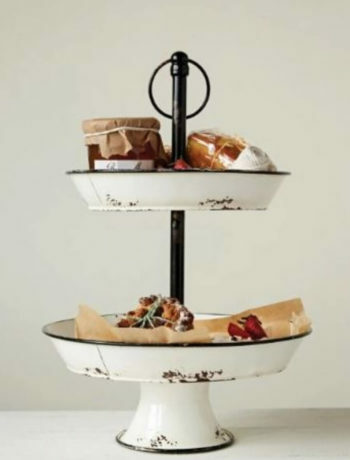 But first, let’s talk about this stencil craft idea. 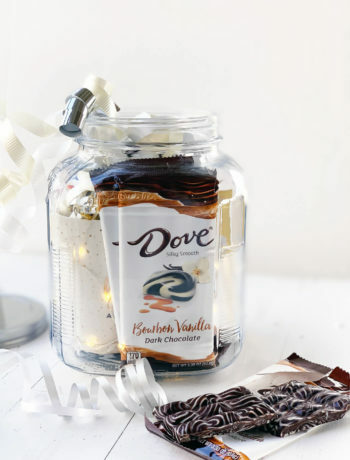 This craft DIY idea for decorating your glassware is so fun and really easy. I had most of the items already on hand. If not, no worries. Everything is pretty affordable and can be found easily. First, you want to clean the outside of the drinking glasses with the rubbing alcohol or vinegar using a soft cloth. 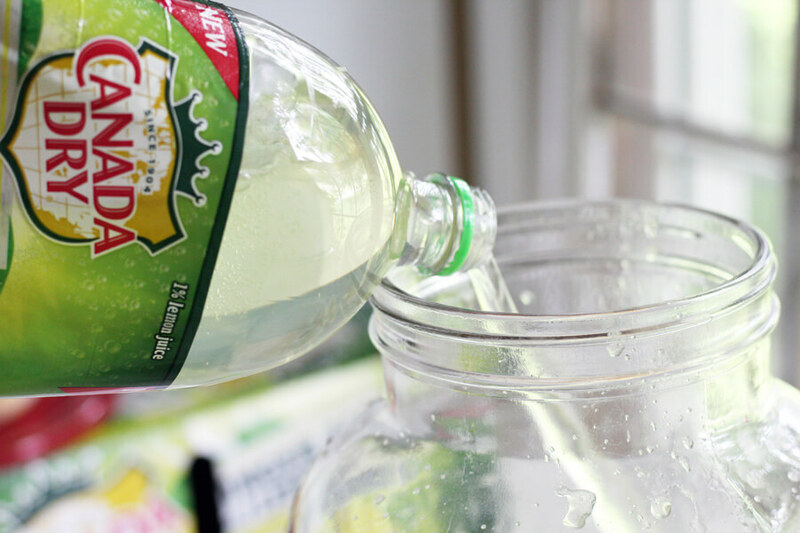 This step makes sure the glass is super clean and free from detergent, chemicals, or fingerprints. Be sure to use a lint-free cloth so you don’t get any fuzzies in your paint job. We wanted summer-fun colors, so we picked a lemony yellow and a pool aqua blue. Use your imagination and let your creativity shine with your color choices. You could even do a fun patriotic theme with red, white and blue using star stencils. Love! Dip the sponge brush or pouncer into the paint. Make a few dabs BEFORE painting over the stencils to get the extra paint off. I like to pounce around using different pressure to create different shading. For example, some of our polka dots on this glass are lightly painted, and others are heavier. This gives the effect of different shades of the same color and I like the depth it gives the glass. 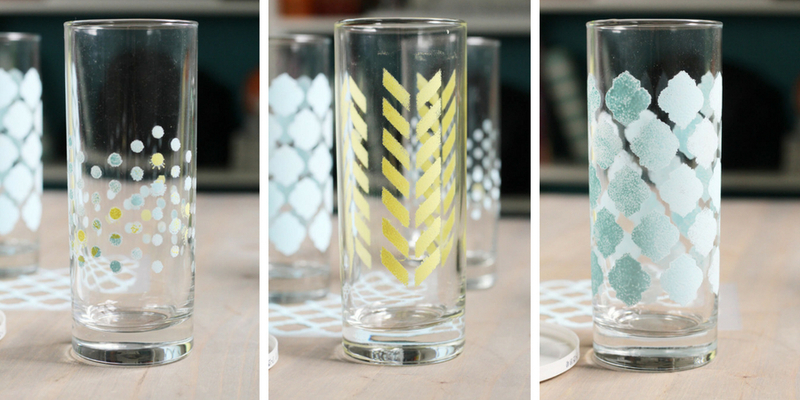 Once you have painted all of your stencil patterns, let the glasses dry. (Refer to the back of your paint for drying times.) I let mine dry to the touch, then CAREFULLY removed the stencils. Acrylic paints dry pretty quickly, so mine came right off with great results. 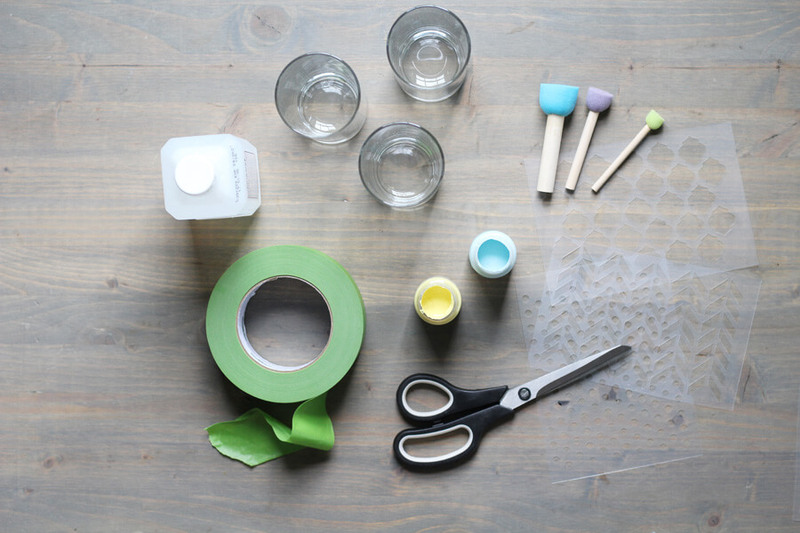 After you remove the stencils, let the glasses air dry completely before the curing process. To permanently keep the paint on, you’ll need to cure the glasses by baking them. Always refer to the curing directions on the back of the paint you are using. We cured ours by placing them on a flat baking sheet and placing them in a COLD oven. Then we turned the oven on 350 degrees, and left the stenciled glasses in for 30 minutes. Remove, cool, and allow to cure for 48 hours before using them. 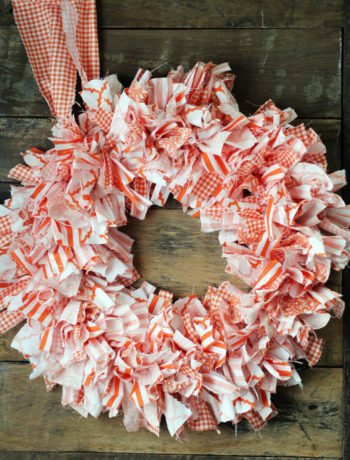 How stinkin’ cute are these? Which one is your favorite? I had a hard time deciding, but I’m digging the yellow arrows. Even my daughter and her friends loved them…so much that they actually took a picture and put them on Instagram. MOM WIN!! Clean the outside of the glasses with rubbing alcohol or white vinegar. Let air dry. Cut stencils to desired shape. Tape stencils securely onto the glass. Make sure the tape is secured and the stencils are flat directly against the glass. 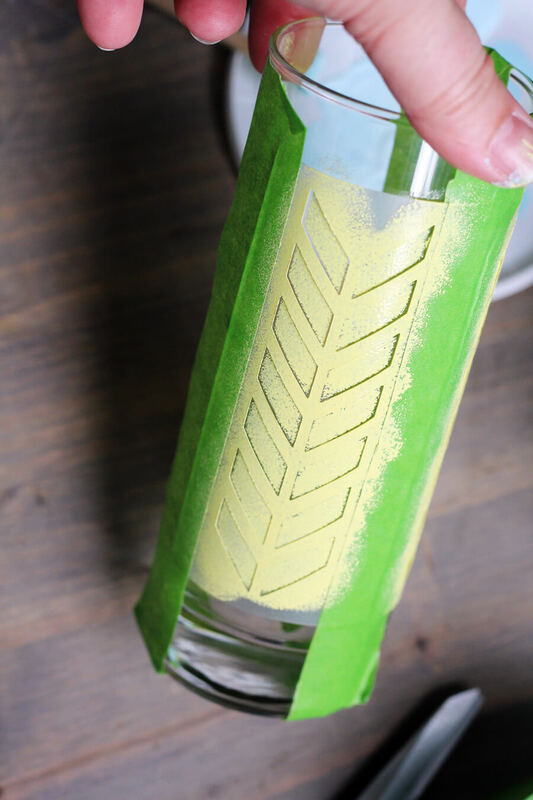 Using acrylic paint and sponge brushes, paint the pattern through the stencil with a gentle dabbing motion. Let the paint dry to the touch. 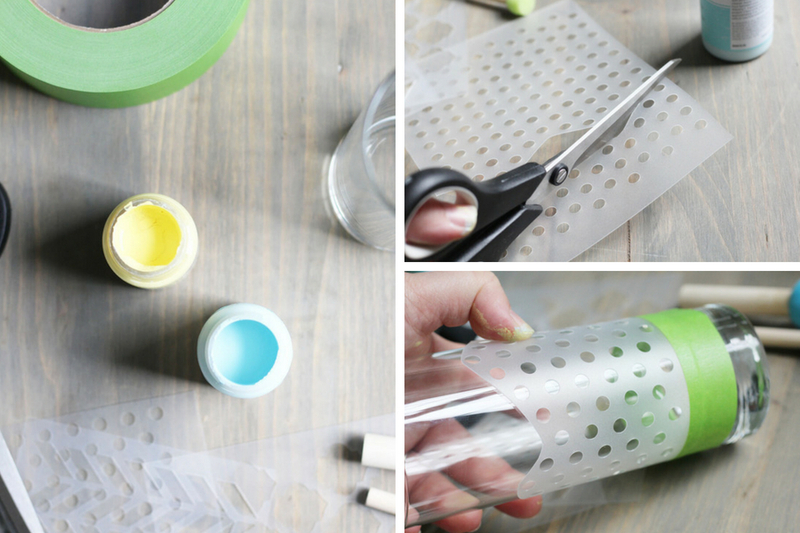 Carefully peel the tape off and remove the stencils. Let air dry completely for about an hour. Cure in the oven according to paint manufacturer’s instructions. Let sit for 48 hours before using. Once you make these fruity Tropical Lemonade Mocktails, you’ll want to make them again and again. This recipe is so perfect for parties, entertaining, or any time you want a cold and refreshing fruity drink. Combine all other ingredients in a large pitcher or jug. The recipe at the end of this post will give you the amounts. Our mocktail mix makes 1 gallon. We recommend you chill the ingredients before combining so everything is ready to serve. If not, no worries, just pop the mocktail punch into the refrigerator until nice and cold. 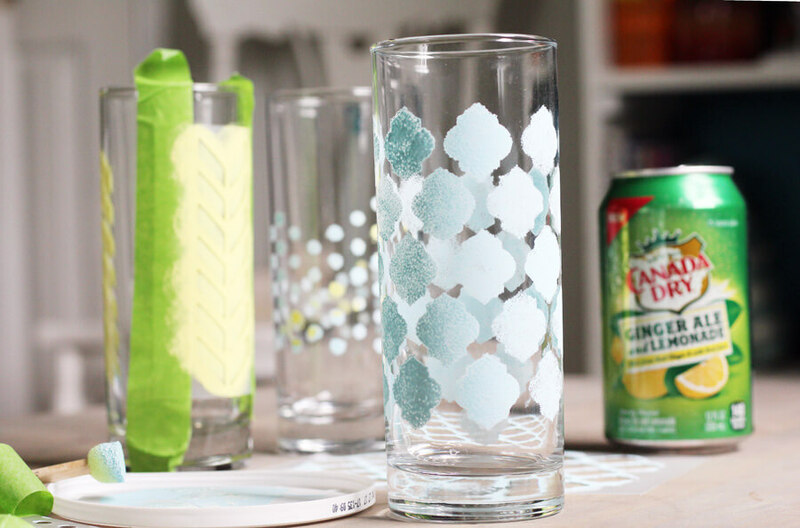 Serve Tropical Lemonade Mocktails over crushed ice in your darling DIY Stenciled Glasses for a relaxing treat. 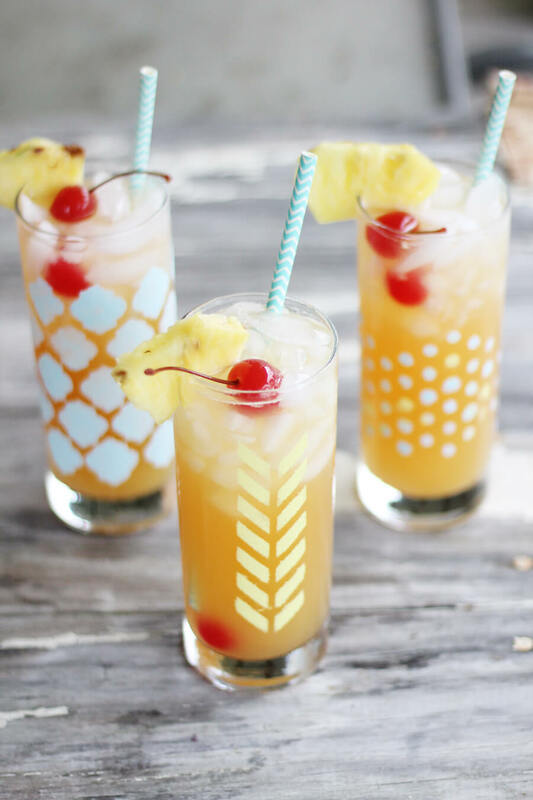 Garnish with fresh pineapple and cherries for an extra tropical touch. Doesn’t it feel great to give yourself a break and relax for a bit?! 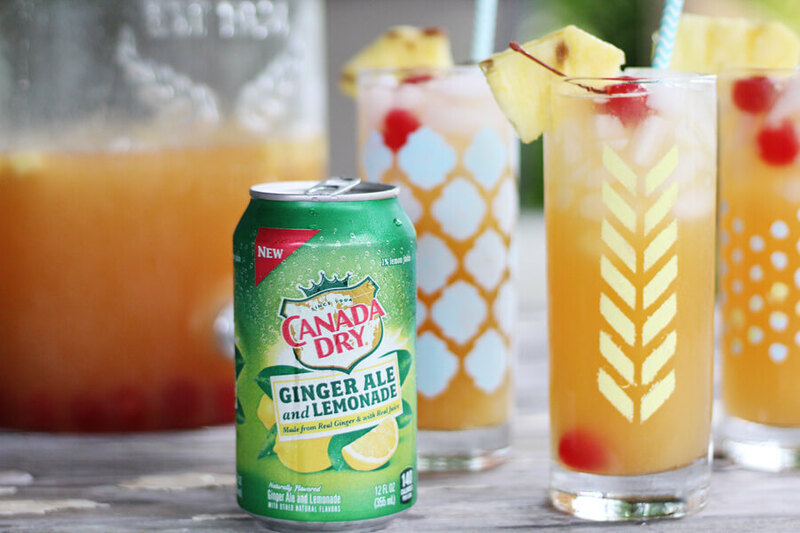 If you love this post, check out our fun Girl’s Night In Party Tutorial with Canada Dry. 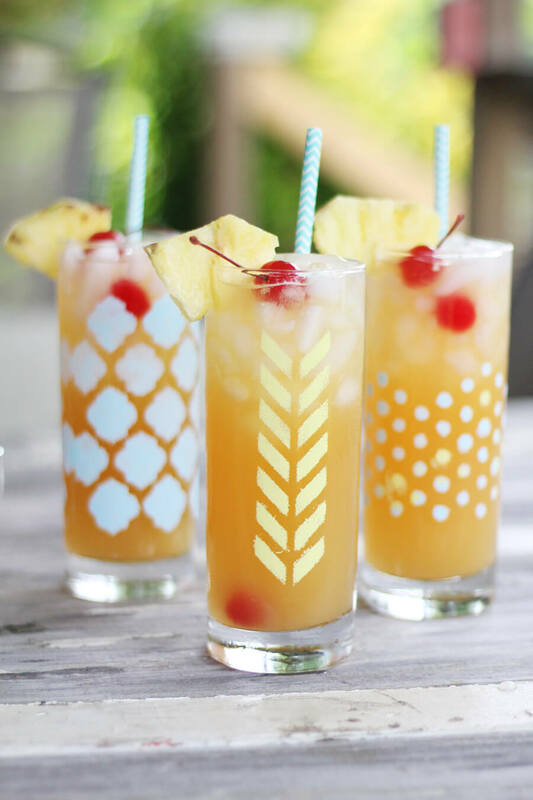 We love mocktail recipes and would love to hear your favorites. Leave us a comment below with your best for us to try this summer. 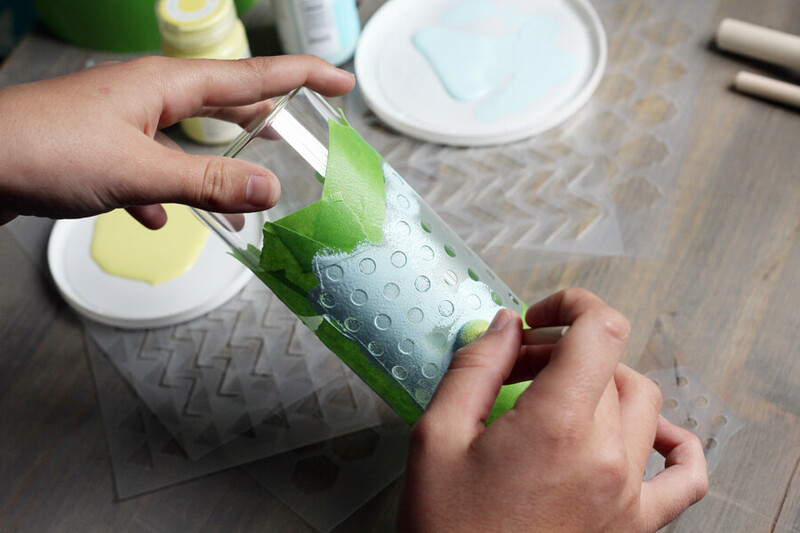 If you try our DIY Stenciled Glass craft, feel free to share your creations on our Facebook page. A sweet + juicy mocktail recipe for tropical lemonade. Refreshing, fruity and sparkling, this party perfect punch is perfect for relaxing on hot summer days. Combine all ingredients in a pitcher or jug. Use the cherries AND the cherry juice. Chill and serve over ice with additional fruit for garnish. Recipe makes about 1 gallon. Recommended serving size is 8 ounces.